I read this article and found it very interesting, thought it might be something for you. The article is called The Government’s (Almost Silent) Agricultural Spending Boost and is located at https://archive.indiaspend.com/sectors/the-governments-almost-silent-agricultural-spending-boost. Finance Minister P Chidambaram re-iterated the UPA Government’s commitment to agriculture when he announced a 22% increase in agricultural lending target to Rs 700,000 crore for banks in 2013-14. He also increased the allocation to the Ministry of Agriculture by 22% to Rs 27,049 crore. Reserve Bank of India (India’s Central Bank) Governor D Subbarao, while presenting the 3rd Quarter Review of Monetary Policy 2012-13 in February 2013 revealed that bank credit to industry has decelerated while credit to agriculture (mainly short-term loans to small and marginal farmers) has increased. 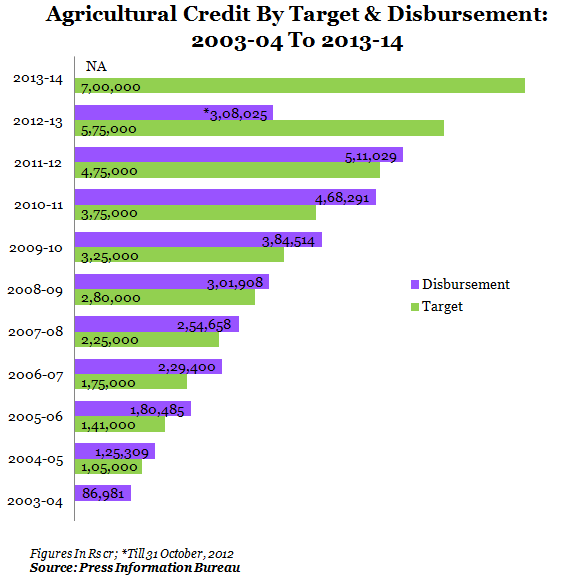 Agriculture credit targets have nearly doubled (86%) in the last four years, i.e. from Rs 375,000 crore in 2010-11 to Rs 700,000 crore in 2013-14. While credit disbursed has always exceeded the target, it was over by Rs 93,000 crore in 2010-11: So, as against a target of Rs 375,000 crore, the disbursement was a whopping Rs 468,291 crore. According to data released by the Ministry of Statistics, agriculture GDP at current prices in 2011-12 was Rs 14,17,366 crore, an increase of 11.6% from Rs 12,69,888 crore in 2010-11. It accounted for 17% of total GDP of Rs 82,32,652 crore. 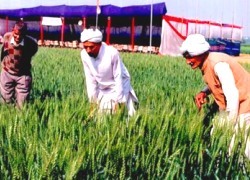 Agriculture constituted 21% of GDP in the third quarter of the current year – Rs 517,439 crore out of total GDP of Rs 24,63,775 crore at current prices. 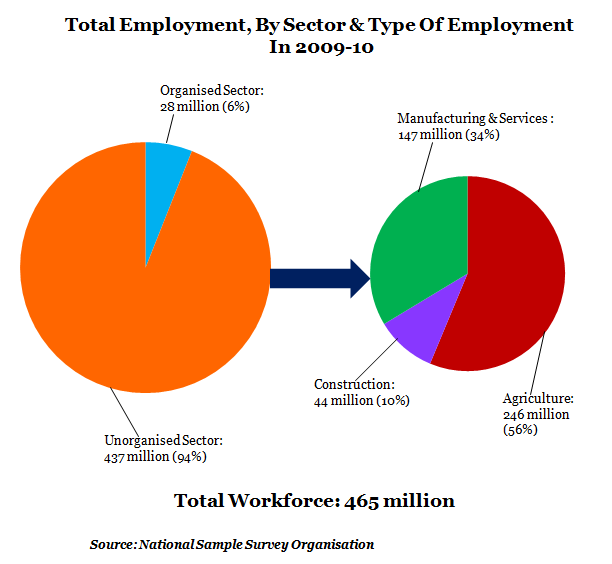 And here is a key data point as to why the Government may be keen to impress the farmers –Minister of State for Labour & Employment Kodikunnil Suresh told the Upper House Rajya Sabha recently that a survey carried out by the National Sample Survey Organisation in the year 2009-2010 showed total employment in both organised and unorganised sector in India stood at 465 million. So, about 53% of the working population (246 million out of 465 million) and 21% of the total population (1.2 billion) are still dependent on agriculture for a living. That’s a number that many are familiar with but it looks a little different when you combine it with or view it in the context of increasing spends.